Florida Georgia Line will debut the brand new music video for the passion-fueled “Stay” across multiple media platforms this week. CMT will air the 48-hour exclusive broadcast premiere today (10/7) on the network as well as on its all-music channel, CMT Pure. The first look online and on apps is slated for Wednesday (10/9) across VEVO, the world’s leading all-premium music video and entertainment platform. 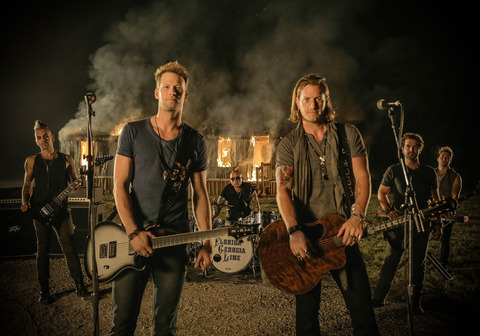 Known for their hit party anthems and high-energy live show, FGL’s Brian Kelley (Ormond Beach, Florida) and Tyler Hubbard (Monroe, Georgia) showcase a much different side in their latest offering. Shot outside of Nashville, the video for “Stay” features vivid imagery of a couple whose fiery emotions reach a boiling point, causing each to struggle with their next move in the relationship. Director Peter Zavadil reinforces the raw scenes with flashes of FGL performing the powerful song. “Stay” is poised to follow in the success of FGL’s consecutive, multi-week #1 smashes in the US and Canada – GOLD-certified “Round Here,” PLATINUM-certified “Get Your Shine On” and MULTI-PLATINUM “Cruise.” Breaking the record for longest #1 on Billboard’s Hot Country Songs Chart, “Cruise” has sold over 6 million downloads in the US alone and is the second best-selling Country single ever, according to SoundScan. FGL is the only artist in history to join Brooks & Dunn in having their first three singles hit #1 for multiple weeks each. On 11/25, FGL will release HERE’S TO THE GOOD TIMES…THIS IS HOW WE ROLL, a deluxe version of their chart-topping debut on Republic Nashville. The hot newcomers, who have taken home multiple ACM and CMT Music Awards, recently earned their first-ever CMA Awards nominations for Vocal Duo of the Year; New Artist of the Year; Single of the Year for “Cruise” and Musical Event of the Year with Nelly for the “Cruise” remix. The awards show will air LIVE on November 6 at 8P ET/PT on ABC. The breakout duo kicked off the weekend with four sold-out dates, headlining their HERE’S TO THE GOOD TIMES TOUR 2013. For additional tour dates and more, visit FloridaGeorgiaLine.com.